The waters of the Pacific Northwest support a variety of productive fisheries including oysters, clams, and mussels, which thrive in the cold, nutrient-rich waters that are periodically upwelled from the deep ocean to the surface along the western coast.1 Oysters in the Pacific Northwest are one of the largest contributors to the $110 million dollar West Coast shellfish industry and support over 3,000 jobs.2 Beginning in 2005, oyster farmers began seeing massive die-offs of up to 80% of their oyster larvae, or “seed”.3 Young oysters are particularly vulnerable to environmental conditions during the first few days of life when they develop roughly 90% of their body weight as calcium carbonate shell.4 The inability of young oysters to develop during this critical period in their lifecycle is an indicator of a significant change in ocean conditions. When pH becomes too low, young oysters' shells disintegrate. When these ocean conditions limit oyster larvae’s ability to survive, oyster hatcheries are left with no larvae to distribute to oyster farms along the coast. The collaboration among governments, industries, scientists, policy-makers, and public officials on the Panel illustrates the value of interdisciplinary cooperation to effectively address large-scale tipping points. Understanding that ocean acidification is the main driver of the massive oyster mortality observed in the region, policymakers and stakeholders have been able to focus on and plan for local management that may alleviate some of the negative consequences of acidic conditions. In the short-term, expanded monitoring and research may yield new remediation or adaptation solutions for the shellfish industry. As ocean acidification becomes more severe and corrosive to the coastal environment of the Pacific Northwest though, solutions will need to focus on both large-scale causes, such as carbon emissions, and local drivers, such as air and land pollution that exacerbate ocean acidification and add stress to marine organisms. A greater understanding of how ecosystems may respond to increasingly acidic conditions will also help managers and decision makers continue to prepare and adapt for changes in the future. 1Washington State Blue Ribbon Panel on Ocean Acidification (2012): Ocean Acidification: From Knowledge to Action, Washington State’s Strategic Response. H. Adelsman and L. Whitely Binder (eds). Washington Department of Ecology, Olympia, Washington. Publication no. 12-01-015. 2NOAA. “Like putting headlights on a car Pacific oysters gain from IOSS data.” 2011. 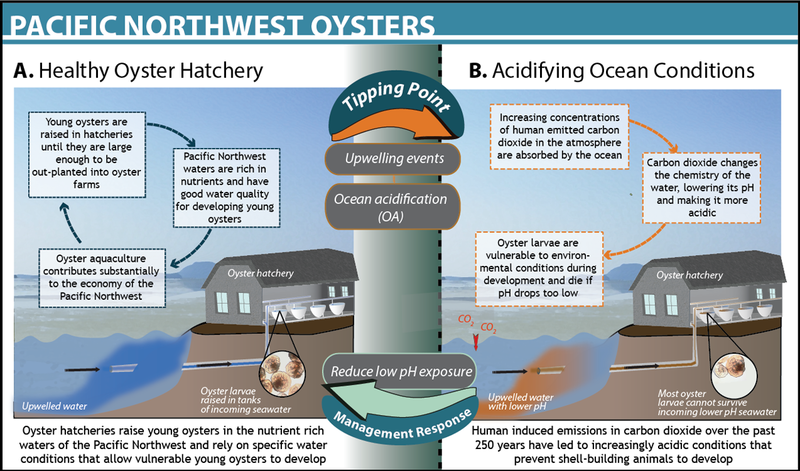 3Grossman, E. “Northwest Oyster Die-offs Show Ocean Acidification Has Arrived.” Yale Environment 360. 5Washington Shellfish Initiative Blue Ribbon Panel on Ocean Acidification (2012): Scientific Summary of Ocean Acidification in Washington State Marine Waters. R. Freely, T. Klinger, J.A. Newton, and M. Chadsey (eds). NOAA/Pacific Marine Environmental Laboratory. Contribution no. 3934.